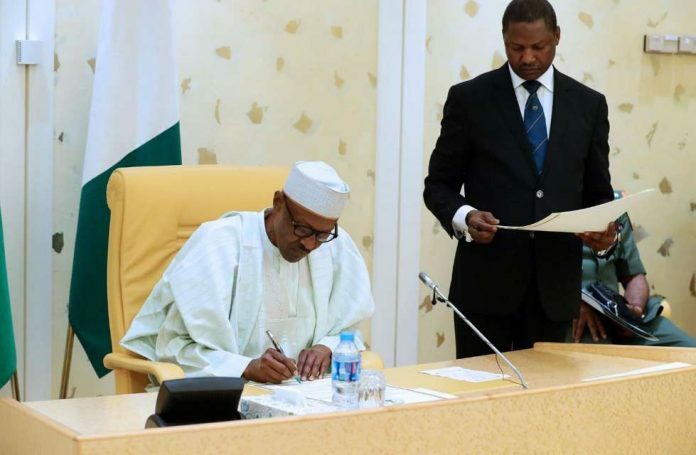 OrderPaperToday – President Muhammadu Buhari has conveyed his decision to veto five bills passed by the National Assembly. The bills include: Nigerian Film Commission, Immigration amendment act, Climate change, Digital Rights and Freedom and Chartered Institute of Pension Practitioners. Buhari’s rejection is in pursuant to section 15 (4) of the 1999 constitution. Reading the letter on Wednesday, the Senate President, Bukola Saraki highlighted the reasons for Buhari’s decline of assent to the bills which was done on the 5th of March 2019. The Nigerian Film Commission bill 2018 was rejected because sections 1 (3) (d) (e) of the bill conflicts section 2 (a) (1) (2) of the National Film and Video Censors board act which confers functions in relation to firm exhibition of the National Film and Video Censors board. The Immigration Amendment bill 2018, according to the President have raised concerns on the retroactive effect on the provisions of section 38 (5) of the bill and the impact of the section on the ease of doing business initiative of the federal government. “There are also concerns that if passed, the bill will be destructive to Nigerians in diaspora if other countries were to reciprocate the provisions of section 38 (5) in their immigration laws”, He stated. Also declined is the Climate change bill 2018 because the scope and guiding principle of the bill replicates the function of the federal ministry of environment “which is charged with mainstreaming climate responses and actions into government polices but does not suggest the scrapping of the ministry. Also, he noted that concerns have also been raised in connection with the propriety of the private investigate panel in conducting criminal investigation as suggested by section 8 (1) of the bill.